Brian Marchant was long-serving country umpire who, like so many of his colleagues, toiled in the bush mostly for the love of football and the camaraderie of his mates. Born in Narrandera on 18 August 1930 Brian Marchant grew up there until age six when the family moved to Kaniva. It was here that he excelled at football, winning a club best and fairest in 1948 for Kaniva Blacks and later playing in the 1953 and 1956 Kaniva teams which were premiers of the Tatiara Football League. They were also runners up in 1955. After moving to Melbourne he was also successful at cricket, playing in the Reporter competition in various grades for many years. .While he was not appointed to a VFL Reserve Grade match during his career he did umpire a number of VCFL finals. The Preliminary Finals of the Ovens and King Football League in 1974 and the Mallee Football League in 1972 being the highlights. Remarkably over the entire span of his 246 match total (13 finals) he never umpired either in his place of birth nor the Narrandera side and only once in eleven Tatiara Football League matches was he appointed to umpire the team in which he had played two premierships – Kaniva versus Tintinara – at virtually the end of his career. Brian retired from umpiring at the end of the 1977 season. 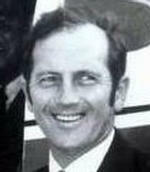 He had been awarded Life Membership in 1974. Aged 78 Brian passed away on 14 May 2009.